A man dressed in traditional Jewish religious dress and described in reports as a Rabbi has been hospitalised this morning after a knife attack by a man who was claimed to have shouted “Allahu Akbar” as he struck. The 62 year old male reportedly avoided death as the knife narrowly missed vital organs as he was stabbed around 11:45 am today. France’s Le Journal du Dimanche (LeJDD) cites “several witnesses” who heard the “Allahu Akhbar” cry, and reports the comment of Strasbourg Rabbi Mendel Samama who visited the injured man in hospital, identified locally as a Rabbi called Mr. Levy. 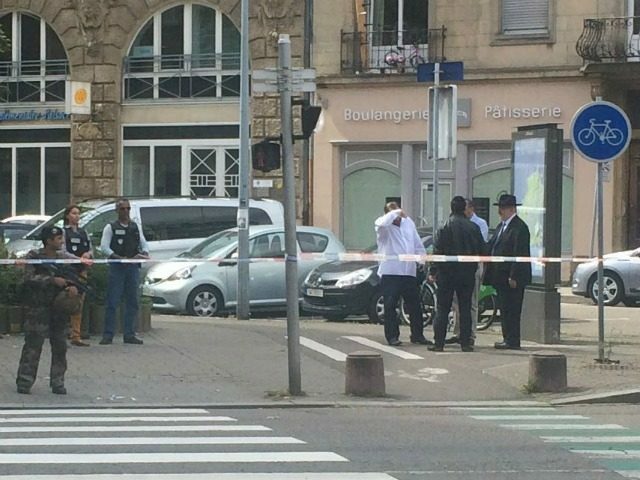 The stabbing took place outside the victim’s home in Strasbourg’s Jewish quarter, just 500 yards from the city’s main Synagogue. The attacker is being held in police custody, and in common with a number of other apparently religiously motivated attacks in Europe in 2016 the perpetrator has a “psychiatric history”. Britain’s Mirror newspaper has reported French police have already discounted terror as a motivation for the attempted “Allahu Akhbar” slaying of the Jewish male. LeJDD reports: “The perpetrator was also known for similar offenses, according to a source familiar with the matter”. France Bleu reported the as of yet unnamed assailant had past form, having already attacked another Jewish man in a similar fashion in 2010. The paper stated the suspected attack was placed into psychiatric care after the last assault.